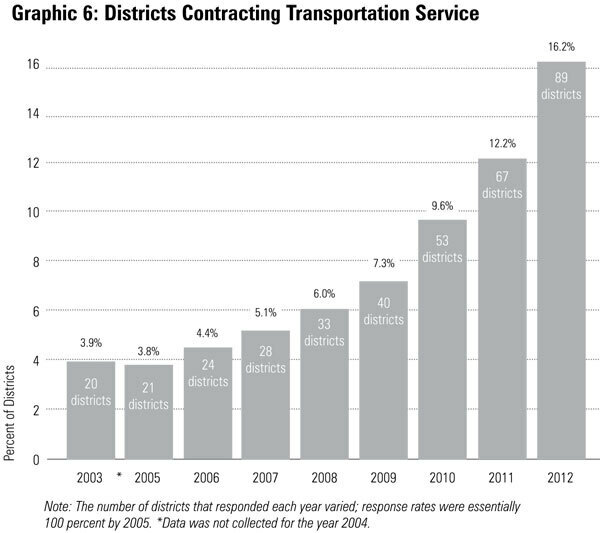 16.2 percent of districts contract out for transportation services (89 out of 549). 26 districts privatized transportation services within the past year. Though not as common as privatization of food or custodial services, transportation contracting is growing rapidly and provides an opportunity for substantial savings to many school districts. The number of districts contracting for transportation grew by 33.1 percent last year — the largest percentage gain of any of the three services. Note: Contracting only for Special Education Transportation is not counted as transportation contracting in this survey, but does represent a popular option. Due to the relatively low density of special education students to be picked up, many districts contract for their transportation collaboratively through their ISDs. Note: The number of districts that responded each year varied; response rates were essentially 100 percent by 2005. *Data was not collected for the year 2004. The Port Huron School District, after sharing Special Education transportation through its ISD for many years, contracted out its general pupil transportation with First Student this past year. This represents the first privatization of a major support service by Port Huron. The district expects to save $533,000. Hancock Public Schools outsourced its transportation this past year to R&A Transportation. Savings from this past year add up to $40,000, roughly $48 per student in this small Upper Peninsula district. The district also reported satisfaction with the private bus drivers. Mona Shores, in Muskegon County, began contracting with METS for its bus drivers, and contracts out for some portion of each of the three major services. The new transportation contract itself is expected to save the district almost $91,000 per year. The district reports that it is satisfied with all three of the private vendors. Dansville Schools contracted out all of its transportation services to Dean Transportation. The district expects major capital outlay savings for the next few years, with total savings of $188,000 during the first year alone. These capital outlay savings will taper off over time, but the district’s projected long-term costs are still lower than the cost of providing transportation service in-house. Sparta Area Schools used a combination of privatization and service downsizing to save $50,000 on transportation. The district consolidated and eliminated a few bus routes, and also began contracting some of its drivers through METS. Bad Axe Public Schools students are now riding Thumb Area Transit buses to and from school. The district projects lower operating costs in the amount of $11,160 per year thanks to privatization, and reports satisfaction with Thumb Area Transit. In addition, the move will save $95,000 that the district would have spent on buying a new bus for this coming school year. Cass City Public Schools in Tuscola County is now privatizing its bus drivers through attrition, while retaining ownership of its bus fleet. The district saves 10 to 13 percent on each employee contracted through METS. Cass City now reports satisfaction with both its bus drivers and its privatized custodial services.